On February 1st, 2017 my first website finally went 404. Its host, arcor.de, shut down. The site hadn’t been maintained since 2008 in any case. It was a personal and interesting learning exercise (archived) although, in the grand scheme of things, an insignificant little site. Nonetheless, in its 15 years online the site allowed me to observe a shift in online users’ behaviour and trends. Thanks to StatCounter, I could see that visitors came from many places, both in linkage and geography. They arrived using the browsers of the day; at first it was IE that ruled the roost, then Firefox took the lead in certain territories. Konqueror, Brave, Opera or Safari (let alone mobile browsers) barely registered on the scale. Spiders have always made up a small percentage of hits. SERPs were the main draw before the dawn of social media. Here are a few observations based on the final statistics I pulled before the site went dark (a mere 515 hits between June 2016 and January 2017). While the appearance of Blackberry is somewhat amusing, the most popular browser by a significant margin today is Chrome — for both desktop/laptop and mobile devices. The iPhone’s browser comes in at second place (ergo: mobile devices = smartphone or tablet). It’s also noteworthy to see that the old IE stalwart continues to edge out the more recent Edge browser. 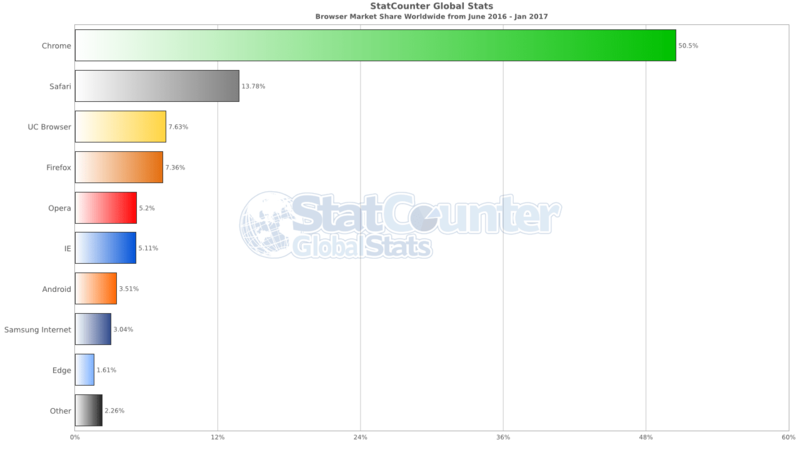 Globally, UC Browser is on par with Firefox, confirming the huge uptake in mobile browsing. This is nothing new. Since there’s something of a relationship between browsers and the operating systems they’re installed on it comes as no surprise that (only) 36 percent of visitors used Windows-based desktop/laptop devices. Android alone (which may include small numbers of TV sets or PVRs) has a share of almost 29 percent! Once you sum up the classic desktop/laptop operating systems (OS X + Chrome OS + Linux + Windows) and then do the same to mobile devices (Android + iOS + Nokia + Blackberry) you’ll come to the insane conclusion that some 46% of my old site’s visitors over the last six months used mobile devices! Desktop devices add up to 45%, the rest are unknown (presumably bots or crawlers). 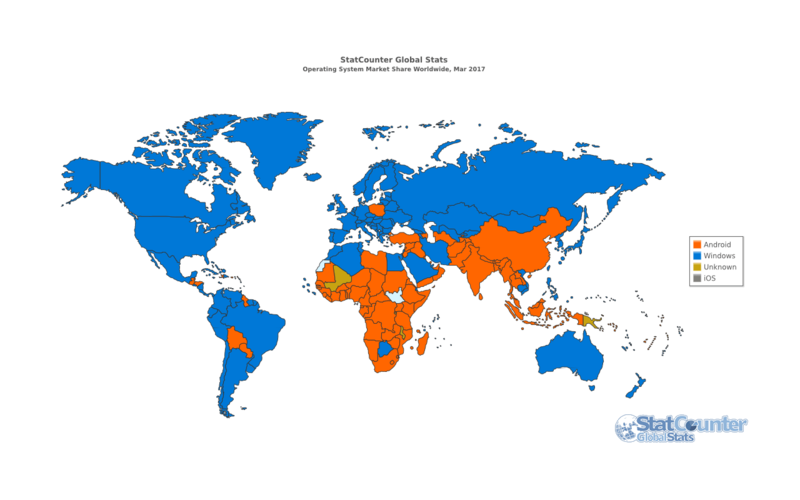 These numbers approximate the global findings by StatCounter (who obviously have access to a much larger data set) and their announcement in March 2017. In April, Android devices would finally come to be the world’s dominant web browsers. Google does it again! Needless to say, it’s the content, function and language of a site that determines who its likely visitors would be. In the case of my old site, it’s a bunch of (largely) text-based jokes, most based on forwarded emails and such stuff. Many are dirty. This bears mentioning because the most explicit ones tend to have huge spikes in visitors from countries with, let’s just say, “medieval beliefs and strict morals”. We made this observation ten years ago already. Unfortunately, today the statistics are restricted (thanks, Google!) so that I’m blind to the majority of search keywords. This, by itself, reveals that most searches in my data set were by users who were logged into Google (Android users usually are). Top keywords were “burning of people”, “people burning” and “xenophobia in south africa burning man”, leading to a minor spike by Indonesian visitors in November 2016 as links to an article written in 2008 got forwarded or posted on social media. 84 of those 294 visitors used smartphones. The very absence of data can say much, too. Hit counters were also buffed up by a Peruvian and an Algerian visitor who spent hours checking out the site using iOS and Win7 respectively. Thanks for stopping by, folks! There’s not enough data to draw any useful conclusions about the most popular operating systems per territory but it is surprising to see that there remain far more Win7 users than Win10 users. Then there are a few brave individuals still surfing with WinXP! 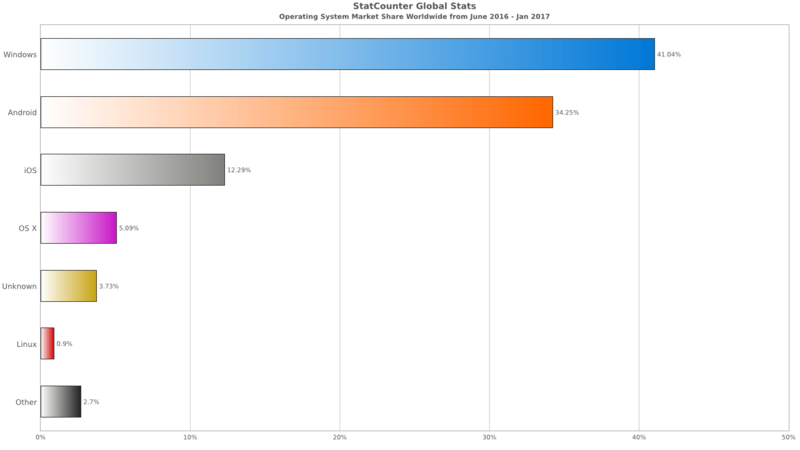 StatCounter’s global statistics for the same period show that 48.4% of Windows visitors used Win7, 30.12% use Win10 while 6.61% use WinXP. Win8/8.1 came in at 13.27% (which would include a substantial number of tablet users). People like to laugh. They want be entertained, and they like to be shocked. Clickbait exists for a reason. People will use most any device to further their immediate needs. It matters not if it’s an old computer or a smartphone with a small screen (so long as it’s responsive). Convenience and immediacy trumps security. Privacy is secondary. As of a few months ago, the majority of users access the web via mobile devices. This is particularly true in “emerging markets” (Botswana and Poland stand out from their immediate neighbours for reasons unknown). These emerging markets happen to be the most populous territories (not traditionally known for disposable income). For Western businesses to tap into these markets, they need to target young smartphone users in China, India, Africa and the Middle East with messaging, news and social media, video, games and personalised day-to-day life enrichment apps, services and utilities. Products need to be (re-)designed accordingly. Sit-down-and-study-intensive data (tl;dr) seems safe with researching desktop users. Utilities and quick snippets of data must cater for mobile audiences. Only the latter can be effectively monetised. The world wide web has effectively split in two. This entry was posted in Internet and tagged analytics, marketing, statistics, web design. Bookmark the permalink.